Now a-days I don’t wear as many heels as I used to when I worked a Corporate job. I will “get all fancy” some days when I “go to town” (that is right, we go to town. It is a bit of a drive!) or to pick up my girls from school and throw on some heels with my blue jeans or a dress. But most days I am in my “Poop Kickers”. I like mine black and high, like most of my heels, but not the kind of high you may be thinking of. I like them tall, tall enough so poop won’t splatter on my clothes when I am washing out waterers and feeders. Or when I am mucking our the coops. 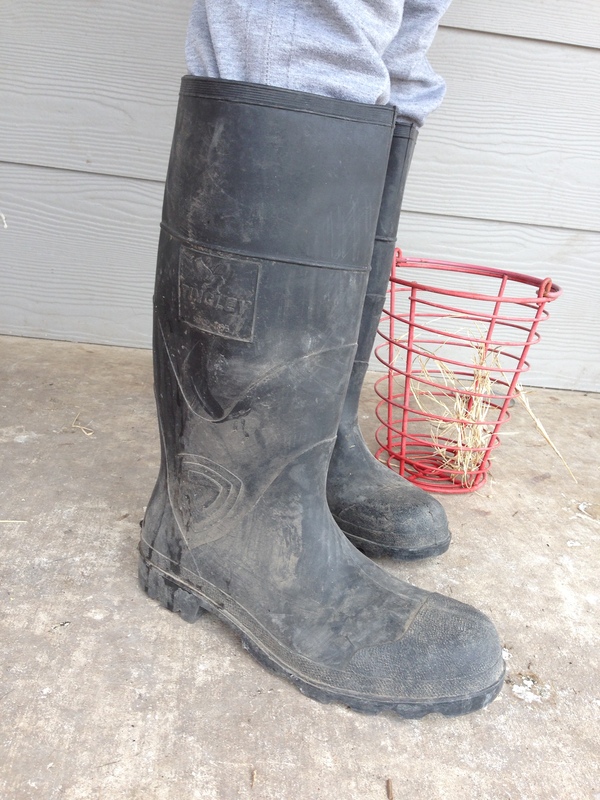 I muck out the coops after a hard rain b/c sometimes it is a sloshy poopy mess…and I sure don’t want my chickens or turkeys living like that where they are supposed to eat and sleep. Some people don’t care…well, if I eat their eggs and meat, I want to know they were clean…..well as clean as I can get them anyway. Also, on processing days, it can get a little messy and no one wants blood on their shoes. I know terrible thought, but hey, it happens. So, below is my $20 selection of foot wear I like to tromp around the homestead in! “High Fashion” poop kickers for the homestead. Tall enough so poops won’t splash on your clothes, and dark enough so the poop/blood doesn’t show! Leave your boots outside near your door so you don’t track poops in your home, and for easy access slipping on and off. Always check your boots before sliding on! Perfect place for scorpions, snakes, and other critters to climb in from the elements. I grab each side of the boot and bang the heel against the porch wall and then shake them out. Hope you enjoy fashionable footwear as much as I do! You don’t have to choose blah colors, as they have many patterns and colors for any personality 🙂 But it is always sad to see a pretty color with poop on it, lol. And Black is Cheaper!